Use what the professionals use for complete carpet moth eradication! PRICE WATCH PROMISE - we guarantee the lowest prices online! Our 7-piece Standard Carpet Moth Killer Kit contains everything you need to eliminate a carpet moth infestation in one room quickly and easily. The comprehensive range of carefully selected carpet moth treatment products will get rid of carpet moths fast and provide ongoing carpet moth control for up to 12 weeks, preventing further damage to your carpets and rugs! The professional-grade carpet moth insecticides in our Kits are supplied by market leaders Rentokil and Pest Expert and are HSE-approved for amateur use, making them the most powerful carpet moth killers available to the DIY user, delivering unbeatable results. Our Standard Kit contains a full one litre of carpet moth spray allowing you to treat up to 25 sq m in a single application or a smaller area several times to achieve complete carpet moth eradication. All our Carpet Moth Killer Kits are supplied with step-by-step instructions on how to apply the carpet moth products, making treatment straightforward and hassle-free. 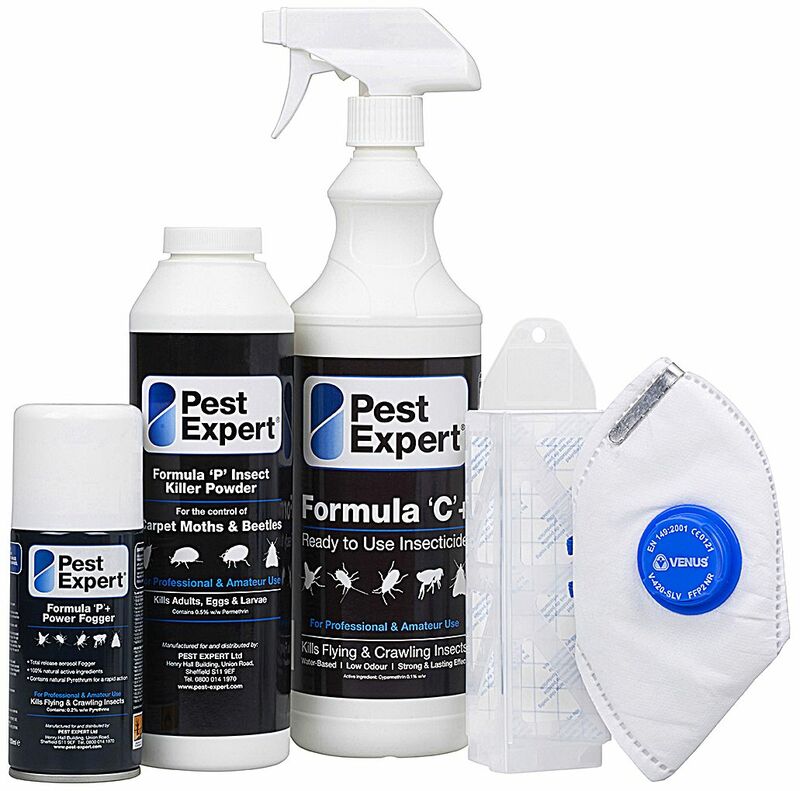 1 x Pest Expert Formula 'C' Moth Killer Spray 1 Ltr: Our best-selling carpet moth spray, Formula ‘C’ is the strongest moth killing insecticide on the amateur market. As well as killing carpet moths on contact, Formula ‘C’ leaves a residue that remains effective for up to 12 weeks, offering long-lasting moth control. Formula ‘C’ is water-based and so can be safely applied to carpets and other soft furnishings. 1 x Pest Expert Formula 'P' Carpet Moth Killer Powder 300g: This permethrin dust is an excellent moth killer and is effective against moth eggs and larvae as well as adult moths. Produced in a puffer pack for easy application, Formula 'P' Powder is particularly good for applying around the edges of the room and to specific areas of damage prior to treatment with the Formula ‘C’ carpet moth spray. 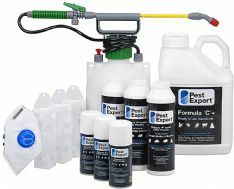 1 x Pest Expert Formula ‘P’ Fogger: A powerful fumigating aerosol device specifically designed for safe use within a home, Foggers release an insecticidal gas that expands to completely fill a room, penetrating even hard-to-reach areas to kill all adult moths. Unlike old-fashioned smoke bombs, Foggers do not present any fire risk as they do not require a naked flame; therefore, they should not be confused with smoke bombs marketed elsewhere as 'Foggers', which need to be lit and left smouldering! 1 x Demi Diamond Moth Pheromone Trap and Holder: This professional-standard moth trap consists of a pheromone lure that attracts and traps the male moth, thus halting reproduction and preventing moth numbers from increasing. In addition, moth traps are an excellent way of detecting and monitoring moth activity before and after treatment. Each pheromone lure is effective for up to 3 months. Where carpet moth damage is more extensive or the carpet moth infestation is affecting a larger-size room or several rooms, please see our larger Carpet Moth Killer Kits. Our Intermediate Carpet Moth Killer Kit Intermediate is designed for the treatment of carpet moth infestations affecting 2-3 rooms, or for those wishing to carry out a more intensive carpet moth treatment to 1-2 rooms. 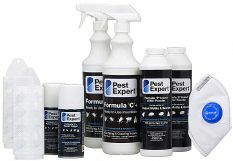 This Kit contains the same high quality carpet moth control products from Pest Expert as the Standard Kit, but in double the quantities at considerably less than double the cost. (Click on 'More Info' tab for further details). After finding moths in my sons' room this was the first website I found. Honestly cannot recommend enough! Fast delivery & easy to use. Would recommend. I only had one or two damaged areas but this soon suppressed it! Ideal for a small infestation. Exceptional service. Went for the expert kit after finding hundreds if not thousands of larvae under the skirting boards and along the edges of the carpet on the ground floor at a house. Lifted all carpets and vacuumed along skirting, placed the white powder under all skirting, replaced carpets, sprayed clear solution along the inner 2 feet of carpet perimeter. Set off bombs etc. Left no odour . A year later we checked and not a single larvae anywhere. We got to the bottom of the problem. You may have to do this properly, but if you do it works. No more moths! We has struggled for ages trying to get rid of carpet moths. Since using the products supplied by Mothkiller UK we have not seen one. It certainly worked for us and if we ever get moths again I will not hesitate to use them again. Good product, good service Product works! A query I had was dealt with very quickly and efficiently. Highly recommended. DOES WHAT IT PROMISES & BEST VALUE We bought one of the carpet moth kits. Having looked long and hard, this was the best value kit we could find online. Furthermore, it worked brilliantly. No more moths! I received a very prompt and professional service from this company. Would recommend to other customers. Hopefully i will not need their services again, but wouldnt hesitate to use again should the need arise. Excellent delivery system. The products arrived the day following that on which the order was placed....with warning of expected delivery time. The explanation sheet was simple to follow and so far the products are working! I would definitely recommend this company. Very speedy service. Instructions were clear and it didn't take long to complete the task! Here's hoping the pesky moths don't come back. Comprehensive kit. Easy instructions Appears to have done the job. No further infestation apparent after 3 weeks! Excellent Service. The kit arrived next day as promised. Good clear instructions only time will tell if we have been successful in eradicating the moths. However happy to recommend this company. Very prompt response and delivery, treatment not completed as yet but consider kit to be good value for money. Quick delivery. Decent price. Good product. Job done. What it said on the tin Goods arrived speedily and as ordered. A problem free purchase online. Very reliable MothKiller .co.uk are a very reliable company who offer a fast delivery and good customer service. I have used them a couple of times. The Right Stuff Everything I needed in one package. Quick delivery and well packaged. Follow the instructions and you can't go wrong. No sign of any moths or larva. would definitely recommend and use again if/when needed. what i noticed is whatever the company said on purchase is what actually happened - there were not silly delays or sorry sir this or that happened. Their logistics were impeccable . Thanks. After discovering that I had carpet moths I found mothkiller.co.uk online and ordered the kit. It arrived the very next day. The instructions provided were easy to follow and the products have so far done exactly what they claimed they would. No more bald patches for my carpets. Excellent service and results. Easy to use product that arrived on time well packaged We found we had a balding patch of carpet so invested in your carpet moth killer. It was an easy website to use, the package arrived very quickly and was in good condition. The product was easy to use by following the clear instruction sheet and seems to have been effective. It does smell so the room had to be kept shut while the product was being used. Very pleased bbut it is early days so still have our fingers crossed! It took a while to dawn on us that the steady increase of little moths was coming from our carpets immediate action was sought. Our carpet provider recommended MothKiller. Pricing was better than from other sites and orders came through very quickly. Instructions were clear and advice over the phone was very helpful. So far no more moths..... Though more 'stuff' may be required to ensure our carpets are safe!! Bought the standard pack as a bit nervous as to how it would work. But, it tackled the infestation under the stairs and in hall and stair carpet. Easy to follow step by step instructions and all you need to do the job. So far so good. The moths appear to be no more. But have left the moth catcher in place to monitor activity. Very efficient service by this company and fast delivery with good communications. Very happy with the purchase. Swift delivery too. Wondered what the rice type cases were on the carpet. The web site described them exactly. Order delivered next day with comprehensive instructions which were easy to follow. Would highly recommend using this company. Used the products over a week ago and so far no moths, after months of them. Let's see if they stay away. Nice change to receive a product with well written instructions. Well packaged and fast delivery. The parcel arrived the day after I ordered it The instructions were clear and easy to follow. The mask was very good and easy to breathe through. I applied the product over two days. Two days later I found two minute live larvae, but nothing since then apart from a dead carpet moth in the trap provided. After a week I cut away the narrow strip of damaged carpet and reapplied the powder and spray to the affected area rather than to the edges of the whole room and adjacent rooms as I had done the first time. So far so good. I intend to repair the damaged carpet with a new strip of carpet in the next few days. Your company hs saved us at least £250. Thank you. A great product. The kit did exactly as described. Very easy to use,simple straightforward instructions and with everything needed(including mask and gloves). I could see almost instant results and the moth problem (which I had not noticed until it was well underway in my bedroom carpet) has been solved. Certainly going to order some of the products again shortly to deal with a smaller problem elsewhere. Having suffered a plague of moths eating our carpets, we sent off for this three part treatment. It has proved most successful, hopefully the little blighters got what they deserved as we have not seen one since the treatment. Pest Expert Formula C is the best product I have ever found for eradicating moths. It is odourless and effective over many weeks without damaging carpets. In addition, the service is amazingly prompt and efficient. We had moth infestation in the lounge carpet, and to a lesser degree, also in the bedroom. I saw this online and thought it was worth a try. I followed the instructions, and did the three stages in order, and I have to say it appears to have done the job .... treated the room in June, and to date ( August) not a moth to be seen ! Would definitely recommend this product. We bought the full kit to deal with moths. 2 weeks later we seem to have won the battle! The instructions for use were very easy to follow and the safety equipment included was good. The products were delivered quickly. Would definitely recommend. I have moths in my carpet. I have tried to get rid of them before without success. The moth catcher shows me how many moths I have and is great. I have put them all round the carpet edges and every day I catch approx 6 moths so the aim is to catch all the adult moths so there will be no larva to eat the carpets. Fast delivery, great products, easy to understand website. Everything delivered as promised in good time. Clear instructions , easy to apply. Just need to wait to see if it works now. Package arrived so quickly, have not yet had the opportunity to clear room to use product, so can't offer feedback on that just yet. The service was excellent. The moth killer seems to have done the job but it is a little early to know yet. The products were easy to apply. The whole process took one day. Clearing the furniture took the longest time. The products were pleasant to use. The gas left an odour so as they say you need to ventilate your rooms afterwards. It was comforting to know we are back to normal now. Very easy company to deal with. I found this very good, did what it said on the package and killed some flies and woodlice as well as the carpet moths! Easy to use and quick delivery. I'd been struggling with carpet moths for over 2 years and couldn't rid my wool based carpet of them. I ordered the small kit, followed the instructions to the letter and happy days - not seen them since. My problem area is stairs, halls and landings and consequently I sometimes find carpet moths flying in other rooms although they only seem to munch in this area. I treated the carpet last week and although I have found a few moths in the lounge and bedroom, there are none in the problem area. I am keeping a close watch and if necessary I will re-fog and spray in a few weeks. Very pleased at the moment considering this was a large infestation. After internet research to deal with carpet moth I decided on MothKiller.co.uk and was very satisfied with the product and service. Mothkiller's service was excellent. I was shocked to find maggots in the carpet of my new house and surfed the internet to find out more about them. Mothkiller's website was excellent at explaining my problem and the course of action required to rid my new home of its unwelcome livestock. It was quick and easy to order products on-line and delivery was amazingly fast. I'm pleased to report the critters are gone and I would heartily recommend Motherkiller.co.uk. Effective efficient every moth dead Problem solved after only one application. .no return of infestation - and so clean! Parcel arrived promptly and as promised. generous container of spray along with powder and fogger. Good to see it came with gloves and mask for safety. Had tried other methods but still invaded by critters. Followed clear instructions and waited to find the moth bodies after spraying several areas. 3 days later I am down to finding just one solitary moth today so I believe the battle may be almost over. Never had an infestation before and now I know about MothKiller company I hope I never will. 2014 definitely an insect year so dont hesitate to buy your supplies from this company !! The goods arrived in time; the instructions were clear and easy to follow. It is very simple to use with easy to follow instructions. Delivery was very prompt. I feel confident the pesky carpet munchers will not return. Still if they do! I know where to go. I bought the package aimed at wiping out Carpet moths as I had an infestation in the bathroom. it was a three stage process but very effective - I now have no moths. When the items arrived I was a bit overawed, but after reading the comprehensive instructions found them easy to follow and used the items as specified in the instructions. It has been 3 weeks now and I haven't seen a single carpet moth, but will retreat again just to be sure. No moths have been found on the sticky paper I have out. A friend has the same problem and I was explaining how effective your product worked. We had a problem with some moths for a few weeks, so tried to by something from a local diy store, but that didn't work. So researched on the web. Found Mothkiller, it had some good reviews, so gave a whirl. It arrived quicker than we thought. We read the instructions, these looked straight forward so went head with it. It's now over 2 weeks since we completed the treatment, touch wood no more moths. We have since recommended to another family member. Well worth the cost and time. Fast, efficient and DEADLY!!!!! I'm impressed. My wife and I were horrified to find that we had a problem with "carpet moths" eating the edge of our lounge carpet. I tried the usual flying insect spray from the supermarket but that was a waist of time. I mentioned this problem to our son-in-law and he said he had a friend in the "pest extermination" trade and would ask him for advice. The reply was the web address MothKiller.co.uk. The website is very good and gives details of what is required for which type of moth or pest and how to use it along with different size kits for "amateur use" depending on the area of carpet affected. I found the kit to suit us and ordered on-line. Within minutes I received an order status e-mail showing order being processed then not long after another mail showing order picked followed by another stating order being despatched. The kit arrived next day with detailed easy to follow instructions on useage and a set of protective gloves and face mask. Fantastic service and products. I would recomend MothKiller.co.uk to anyone I come across who has any type of moth or flying "beasty" problems. I cannot remember the last time I had service as good as this. the instructions were easy to follow and the products were delivered the next day as promised. took a couple of hours to apply the treatments but the results were excellent. Excellent delivery and packaging, easy to apply products The products were delivered on time, well packaged. Clear instructions were given on how to apply the products. There was definitely enough of each product to do the room. Products were easy to apply. Still to early to say whether the products have actually done their job as they were only applied 3 days ago, but all looks well so far. Would definitely buy from Mothkiller.co.uk again. Super fast shipment and excellent products! The products arrived the next day. I followed the instructions to the letter and lo and behold, carpet moths are gone! The trap has caught 4 stragglers in the last 4 weeks. Before that, in the affected room, I could see around 10 at any one time on the walls and many in the carpet. Highly recommended. Great products that really work! Had problems with small moths in our house. They didn't seem to be getting into food or eating carpets but we would wake up each morning and there would be half a dozen or so on the walls or ceiling. Tried some environmentally friendly sprays but didn't seem to do anything. Purchased the carpet moth kit from Mothkiller, carried out the instructions and hey presto no moths for 2 weeks now. It does what it says on the tin A full kit with very good instructions. Hopefully we have eliminated our moth infestation. Delivered on time and worked well. I bought this product as we had a bad carpet moth infestation. I used the treatments and within a day all the moths had gone. Brilliant. Having suffered for a year or more from carpet moths eating holes one room's carpets we tried the Mothkiller and found the fogger to probably be the most effective element of the kit. We haven't found any more larvae since treatment and are keeping our fingers crossed. Product worked well and I would recommend it. Product did exactly what it said on the tin. Easy to use and very effective Company were brilliant, kept me informed at all times and delivery arrived when they said it would. 1 treatment as instructed did the job Products arrived quickly, instructions were detailed and after using powder, spray and "bomb" we have not seen another carpet moth. GREAT STUFF It does what it says - one treatment so far and the moths are dropping like flies. The process was straight forward and it appears to have taken effect ok. The fumer was a little difficult to lock on and the mask was a necessity. Having discovered I had carpet moths I found this company online and bought the standard kit to treat the room with. The kit arrive promptly and the instructions were very easy to understand and the procedure easy to carry out. It looks like it will do the job so I would use again and recommend this company. No problems with service or product. Standard Moth Kit with easy to follow instructions and impressive results - Bought the standard pack as a bit nervous as to how it would work. But, it tackled the infestation under the stairs and in hall and stair carpet. Easy to follow step by step instructions and all you need to do the job. So far so good. The moths appear to be no more. But have left the moth catcher in place to monitor activity. Very efficient service by this company and fast delivery with good communications. Worked first time. Well worth the money. Saved nearly £200 on what was quoted by carpet firm and was so easy to do. I have had a problem with moths for a while and they have caused a lot of damage to family clothes and carpet (the larvae). I tried everything to get rid of them but nothing worked. I looked online and purchased some moth pesticide from mothkiller. co.uk and it worked a treat. I haven't seen a moth since and its a while since i used it. I would highly recommend your products.